Ayaz and Sabrina’s Love tale took us out to Niagara on the Lake where we had a complete blast! In addition to their photo session posted below – here is their love tale video that we’ll be showing at their wedding! Hope you enjoy! We didn’t finish getting over the amazing response we revieved from the engagement shoot… and in no time did this couple’s wedding come up on us! And just after the day of their wedding, we have yet another video to wow over!!!! We’re certainly finding new joys and excitements as we experience more weddings, couples, families and friends. This wedding was an amazing shoot – with amazing stories, told by amazing people. I really have to thank everyone part of this day for bringing such great spirits, smiles and emotion for us to capture. A special thanks goes to Cheryl for sticking it out in the cold as we walked around Union Ville on their Love shoot in ‘Frost Warning’ Weather!!!! Definitely a champ bride! Thanks to everyone that was part of this day! wAwwwww so beautiful Cheryl, and very handsome Sheldon! This was great and such beautiful memories! I know nothing about photography or videography, but those pics are great and the videos are amazing. First of all I would like to state that spot studios did an amazing job. I’ve never seen anything like this at a wedding, so kudos on the creativity and hard work you guys put into my cousins wedding. Now Sheldon and Cheryl, if I didn’t already know how much you guys love eachother. I would have to give it up to spot for doing great camera tricks and writting a good script. But seriously, your wedding was beautiful and if you two didn’t tie the knot I would have been extremely surprised and disappointed.I admire your love and wish you more love and happiness to come. True love is not always found, so don’t ever take it for granted. Treat eachother as if everyday is your last day together. Mike, you captured such amazing moments for this couple, and your talent as a videographer and editor is just amazing. Keep up the great work! Rob, I am so in love with the photos you did for this couple, just breathtaking and perfect. Keep up the great work as well! Wow, thanks guys! We had an amazing time, and thanks for letting us be a part of it! OMG….I loved IT!! I’ve already watch it so many times in the last hour! You made me totally relive Sunday all over again. Thank you so much for pulling this together. I cannot wait to see more! Your professionalism, creativity, team work, passion and now popularity definately lit up our wedding day. Thanks for taking care of us, you certainly marked a special “SPOT” in our hearts. We can never go back in the past, but we can always rewind history. 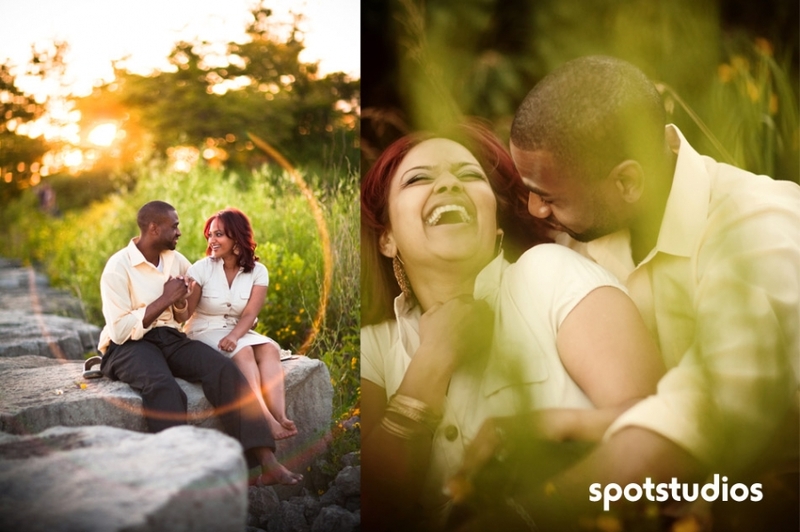 Cheryl and Sheldon were one of the very first couples to book with spotstudios. They signed long before we built our portfolio with substance, or even before had a Studio Space!!! (I actually remember meeting them in a cafe at Bay and Bloor – where Sheldon was very skeptical of us still being around by the time their day came up). So I must admit to being very privileged that Cheryl and Sheldon gave us the opportunity and their trust – allowing us to be part of their day and document their unique story of passion, love and commitment. For someone to give us the opportunity to prove ourselves; and to have faith in our success is really something we don’t take for granted. Please enjoy some of their engagement photos and our love story of Cheryl and Sheldon! Engagement Shoots are always fun for Rob and I – They allow us to break the ice with a couple, show them how we work, introduce them to some of our equipment, and gives us the opportunity to build a rapport with our clients. Because every couple we deal with is completely different, we really find value in such events. Actually, it really drives our success as a vendorâ€¦ as we like to get really comfortable and familiar with our clients before we spend an entire day together; pointing cameras in their face from morning till night! And even more so when youâ€™re going to be pointing cameras at a couple for a 4 DAY Wedding!!!! As we prepare for Ayaz and Sabrinaâ€™s 4 Day Wedding Celebration â€“ weâ€™re glad that they gave us the privilege of having such an opportunity. We headed out to Niagara-on-the-Lake and had a complete blast! We shot between the rows of vineyards, by the lake side, throughout the historic town â€“ and even deep in the bush! (Did I mention that I hate mosquitoes and recommend each couple to bring repellent to all their shoots â€“ For Rob displays a true passion for the BUSHES!!!). Weâ€™re all really looking forward to their wedding, and canâ€™t wait for another amazing experience with these two. Here is a teaser of what we captured from our shoot with Ayaz and Sabrina. You made grown men cry… just beautiful. With every composition that we present, our goal is to capture the raw personality, emotion and character that one exudes on their wedding day. We believe that it’s these particulars that allow our edits to tell a story. Creating a true reminiscence of what sensations were really experienced – at one of the most memorable times in life. Heather and Dash oozed with personality and character, making it a complete pleasure to be part of this wonderful story of Love!! It was a day full of amazing moments, funny tales and even some Australian Etiquette Training!!! (Like assigning nicknames 🙂 ) The church was grand, the venue was stunning and all in attendance were welcoming, fun and entertaining. Here is a Same Day Edit we put together to display the emotions, characters and personalities we captured while documenting a spectacle of beauty and class. No matter how many times we watch this video it never gets old. We absolutely loved the whole day and to have it captured for us in the same day with such perfection really shows how good you guys are. We have been able to show it to all of our family and friends and everyone says the same thing, that all they want to do is get married and have you as their photo and video team!! Thanks for such an authentic recording of so many significant moments. HeeHee and Dash look so happy and beautiful (handsome)- just the way they were on the day! Having this video to keep looking at has made our return to Australia a bit easier! Can’t wait to see the compete video and the stills. You’ve done an amazing job (without making it seem like work. Thank you to everyone for such kind remarks. We had an amazing time putting this together (and I want to send my appreciation to everyone that make it possible!) Michael, our hearts are truelly in every piece that we compose, and my gratitude goes to you for noticing! Wonderful display of taking your jobs seriously; showing a passion for what you do. This must be one of the best wedding videos I have ever seen! You guys have really stepped up the game and make it evident that your heart and souls are in this piece. Absolutely amazing! I`ve never seen anything like this….gave me goosebumps and tears….. WOW!!!! this is amazing! I officially stopped watching my wedding video because of you guys. This makes mine look like it was done 20 years ago and it was last year! This is amazing… I really like the shots! This is not what I expected when you said you did wedding videos!! These really look like commercials/trailers for a full feature film! Really amazing work! Amazing Shots, Great Song (love the fray), and wow – what a church! I absolutlely love your work!!! Your post nails it Mike – you guys really captured the couple’s emotions – their faces really show what they were feeling. I’m sure they were very pleased!